I have been studying English since the age of 9 and living in USA for the past two years, so I was quite sure the feeling when I don’t know something or can’t pronounce a word is long gone. That is until I came to New Orleans, opened a menu in a restaurant and saw names like jambalaya, etouffee, beignets and muffuletta. Iconic foods one absolutely must eat in New Orleans tend to have intimidating names. 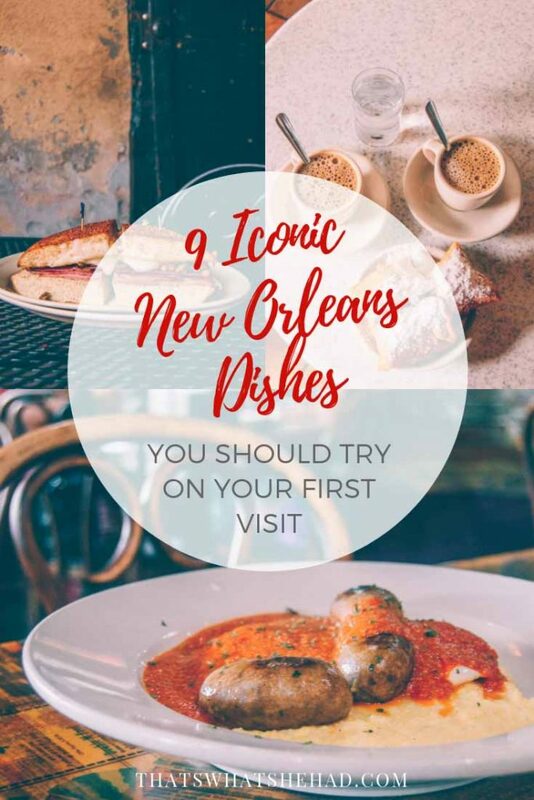 With a little help of my friend Google, I was able to order all those scary-sounding dishes and discover a whole new world of Creole and Cajun cuisines, popular in New Orleans. 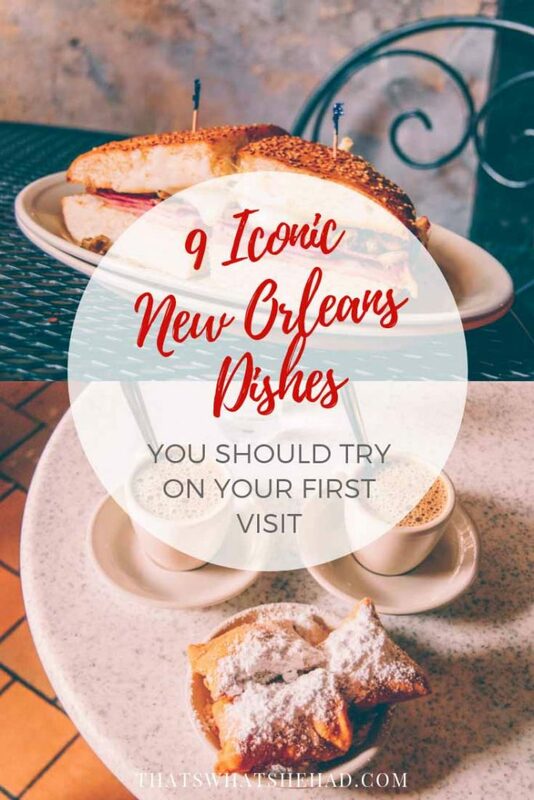 In this post, I’ll share some of the most legendary dishes New Orleans has to offer and where to find them. I also included the right pronunciation, so you sound like a local! Beignets are best described as French doughnuts without a hole. The dough is cut into squares, deep-fried and served with heaps of powdered sugar on top. In New Orleans, beignets are served in orders of three which is easily enough for two people. Given that New Orleans is one of the most romantic getaways in Louisiana, sharing this messy affair of a dessert would be the ultimate romantic experience. The classic way to have beignets is with café au lait. New Orleans café au lait, though, is not your regular coffee with milk. Dark roasted coffee is usually infused with chicory. Chicory, the root of endive plant, can actually be consumed on its own if you want to avoid caffeine. In The Big Easy chicory is roasted, ground and added to dark roasted coffee to soften the bitterness. This tradition evolved during Civil War. When Louisiana joined Confederacy in 1861, the Union blocked the Mississippi River making access to many foods difficult. Coffee was scarce at the time so chicory was added to make it last longer. Besides, chicory added body and flavor to coffee. Café au lait means that chicory infused coffee is mixed with milk half and half. 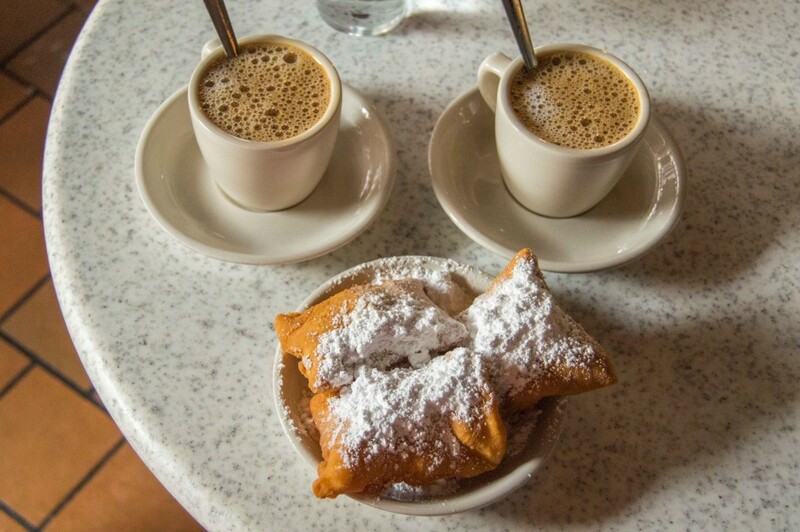 There’s no discussion about where to have your beignets and café au lait in New Orleans, especially if it’s your first time. Café Du Monde! This is a world-famous café that serves the best beignets in the city since 1862. It’s open 24 hours a day, seven days a week. The only exception is Christmas day. Gumbo is a hearty rich soup popular in both Creole and Cajun cuisines. The soup has its roots firmly planted in West African cultures and was brought to Louisiana by enslaved people in the beginning of 18th century. In several West African languages “ki ngombo” stands for okra, which is one of the main ingredients used in gumbo as a thickening agent. Although the heritage of the dish is African, there were other cultures that influenced this iconic soup throughout the years. In off-season okra was substituted for so-called filé powder made of sassafras leaves grown in Louisiana by Native tribes. Fast-forward a century and you will see that roux, a mix of fat and flour invented by French, became the base of gumbo. Creoles would make roux by mixing butter and flour and stirring it over heat until it becomes light-brown. Cajuns would often use pork fat mixed with flour and wait till it turns dark-brown for a smokier flavor. Then the Holy Trinity of Louisiana cooking is added: onion, celery and bell pepper. Apart from obvious gastronomic purposes, vegetables are added to help slow down the cooking process since roux is easily burned. In its turn, the heat from roux softens and wilts the vegetables. Lastly, the meats! The kind of meat used for gumbo depended on the time of the year. In summer seafood was available, in fall – venison and alligator meat, in winter smoked and preserved meats like ham or Andouille sausage. 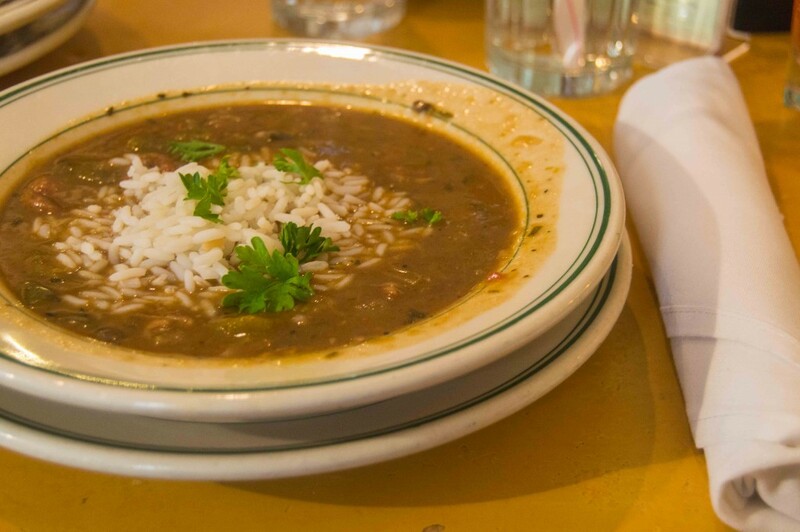 During Lent gumbo z’herbes (green gumbo) was traditionally prepared with odd number of greens. You can read more about the history and evolution of gumbo in these articles on Serious Eats here and here. Jambalaya, like gumbo, is a dish popular in both Creole and Cajun cuisines. Simply explained, jambalaya is somewhat like Spanish paella, a mixture of rice, meats and vegetables. If you dig into history and see that Louisiana was once a Spanish colony, it makes sense that paella is the ancestor of jambalaya. Spanish colonists brought the recipe to the New World and used locally available ingredients to recreate their beloved dish. That also explains how tomatoes found its way into jambalaya. It doesn’t make much sense, to my mind, but a wide-spread explanation is that tomatoes were supposed to substitute saffron (used in paella) that was too expensive to import. Since importing tomatoes was only possible for Creoles who lived in New Orleans and had access to port, tomato jambalaya is called Creole jambalaya or red jambalaya. Cajun jambalaya traditionally doesn’t include tomatoes since they were not available in South Louisiana where Cajuns lived. 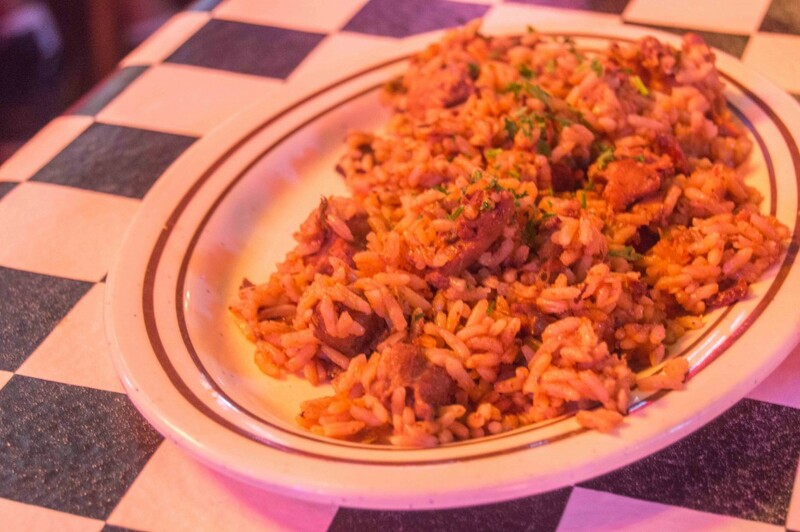 The quintessential New Orleans dish traditionally served on Mondays. Why Mondays? Because back in the day Monday was a laundry day and women had to wash clothes by hand. That means the dinner had to be something simple that can take care of itself. Red beans were soaked overnight. The meats in this dish are simply leftovers from Sunday’s dinner. All you had to do on Monday is cover beans with water and let it simmer. When the beans are soft, throw in meat leftovers, spices and voila! The laundry is done and dinner is ready. 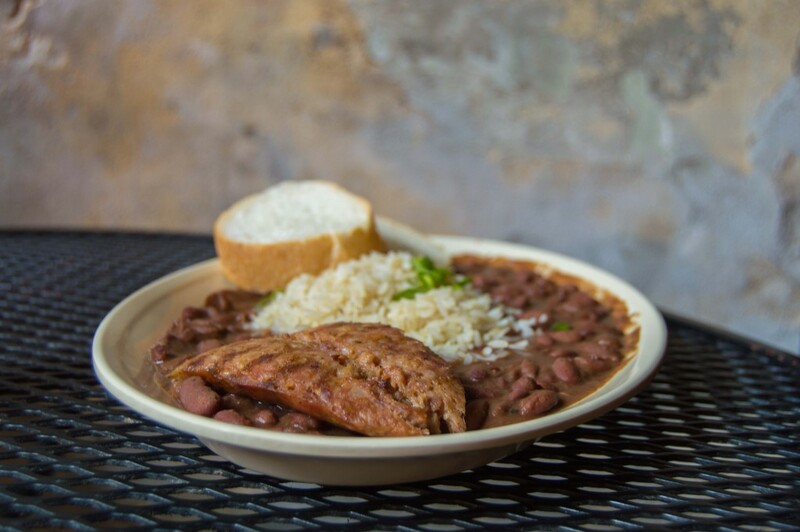 Red beans are usually served with white rice on side and a sausage like Andouille. Simply explained, it’s a giant Italian sandwich. That’s right, not only New Orleans food was influenced by French, Spanish, West African and Native American cuisines. Italian heritage can be clearly recognized too. Muffuletta is a creation of Signor Salvatore Lupo, a Sicilian immigrant, who owned a small grocery shop in French Market of New Orleans. The name of that shop was Central Grocery and all those years later it can still be found on Decatur Street under a board saying “home of the original muffuletta”. According to the legend, the sandwich was created for workers who would stop by the grocery shop at lunchtime, buy a loaf of muffuletto bread, cheese, cold cuts and olives, and eat them standing up and juggling all the ingredients on their lap. So the owner came up with a sandwich to make it easier. 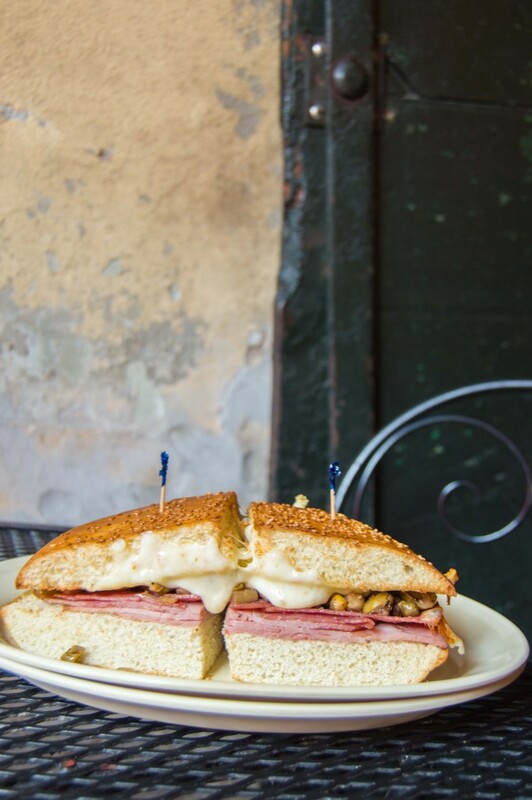 That happened in 1906 and since then muffuletta has become synonymous with the city of New Orleans. Muffuletto bread, used for the sandwich, is round in shape and pretty huge (the diameter is 10’’ or 25 cm). Crispy on the outside and soft inside, the bread is layered with salami, mortadella, ham, provolone cheese and, most importantly, olive salad made of two types of olives, capers, garlic and olive oil. Original muffuletta is served cold, but nowadays many restaurants toast it to make cheese melt slightly. On the picture is only half a muffuletta and it can be easily shared by two. You can order a quarter, a half or a whole muffuletta. For a change, the name is pretty self-explanatory. 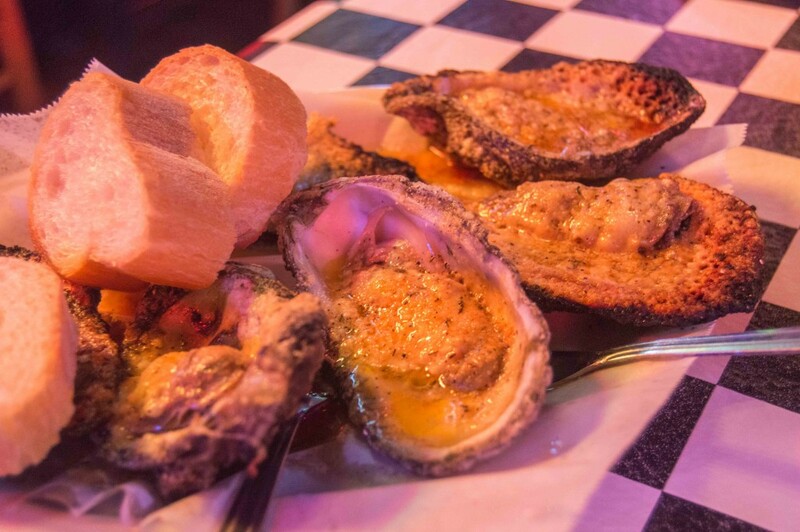 Louisiana is famous for its oyster production, ranking second in the United States after Washington. The oysters found in the Gulf of Mexico tend to be plump with mild flavor which makes them perfectly suited for cooking. For this dish oysters on the half shell are cooked on a charcoal grill, covered with herb-infused butter and sprinkled with cheese blend. They are served sizzling with soft white bread on side. Dipping chunks of white bread into butter is the most satisfying experience anyone can have. This was, hands down, the best dish I’ve tried during my three-day stay in The Big Easy! Po’boy is probably on of the most popular cheap eats in New Orleans. The sandwich was created in 1929 by brothers Bennie and Clovis Martin. Po’boy is actually a shortened version of “poor boy” and, unlike many other iconic dishes of New Orleans, po’boy has well- documented origins. The legendary sandwich was invented during the strike of the streetcar motormen and conductors in 1929. Martin Brothers owned a Coffee Stand and Restaurant in the French Market and, like many people at the time, sympathized with striking workers. “We fed those men free of charge until the strike ended. Whenever we saw one of the striking men coming, one of us would say ‘here comes another poor boy,’” recalled Bennie Martin. Martins used traditional French baguette at first but its narrowed ends meant that much of each loaf was wasted. So they collaborated with baker John Gendusa to develop an evenly shaped rectangular loaf. They would dress it up with veggies and mayo. By the way, don’t be surprised when you order a po’boy and hear a question “dressed up?” In New Orleans dressing doesn’t only mean a sauce or condiment, it means your po’boy will have lettuce, tomato, pickles and mayo in it. Then a ladle of so-called debris was added – pieces of beef that fall of the bone during roasting, coated in meat’s fat and gravy. The first po’boys didn’t have much meat but they were inexpensive to make, filling and delicious! Today the variety of fillings is mind-blowing: shrimps, oysters, roast beef, chicken, sausage… the list goes on. What doesn’t change is the French bread which makes po’boy so amazing. It so happened that I tried my first New Orleans po’boy right before hitting the road home at 5.30 am. The enormous sandwich made for a satisfying breakfast and the last memory of the city. It was so big that I had leftovers for lunch. Where to try it: Verti Marte – a little deli (take out only) located at 1201 Royal St. They don’t have a website but the deli is open 24/7. 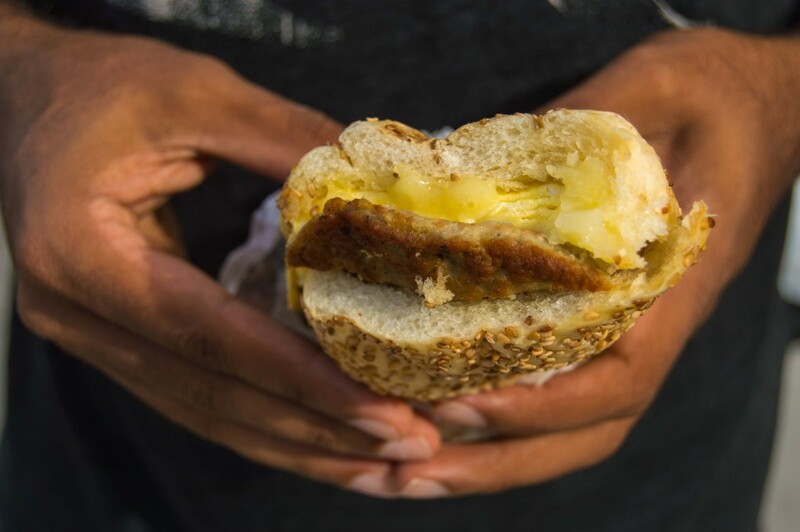 Boudin is a Cajun sausage born out of necessity more than anything else. It’s made of pork leftovers that are mixed with rice to add volume as well as flavor and stuffed into a casing. Cajun boudin traces its lineage to French boudin blanc (white boudin). Although if you look at the recipe closely, you will notice that French boudin made of pork, chicken or veal mixed with cognac and spices has little to do with its Louisiana descendant. 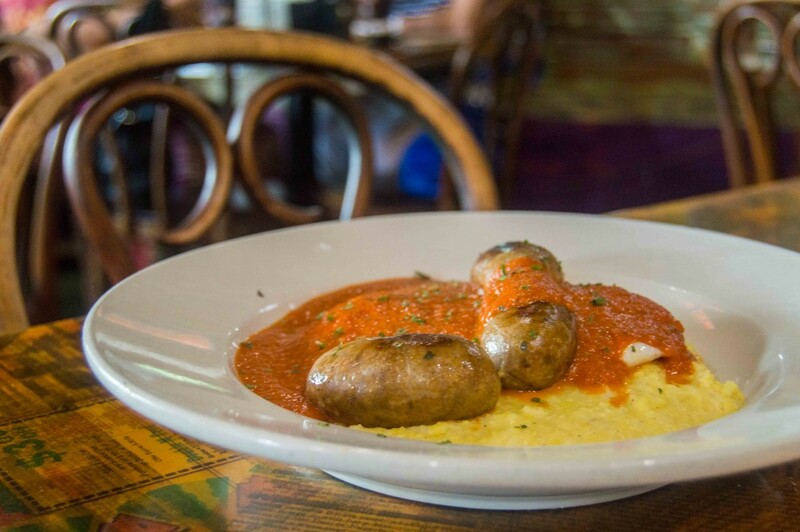 Boudin makes for a great breakfast and that’s exactly how I tried it: served along with grits, 2 eggs, and creamy piquant sauce at a little cafe Tout De Suite near the place where I stayed. As New Orleans is a popular destination for bachelor parties and girls’ getaways, drinking is hard to avoid. 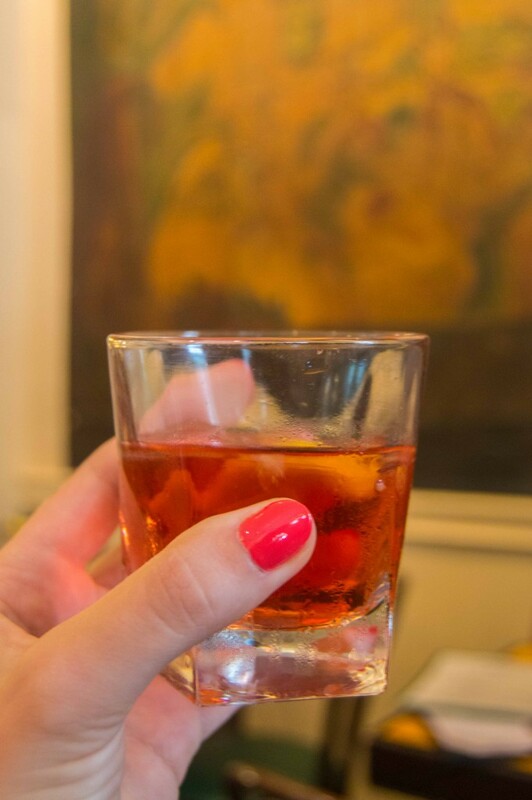 Sazerac is a must-try cocktail in New Orleans. It is widely believed to be the first cocktail ever mixed up in the United States, although there are many factors opposing this story. It is also the official cocktail of the city of New Orleans. Sazerac was an invention of Antoine Amadie Peychaud, a New Orleans pharmacist who had a shop in French Quarter in the 19th century. One day, mixing up a toddy for his friends, he combined French brandy, absinthe, some sugar and a mix of his secret aromatic bitters he usually used to relieve his patients’ ails. Thus, the legendary drink was born. In 1870-s cognac was substituted for whiskey that was more popular and easily available in USA. After absinthe was banned in 1912, it was also replaced by a locally-produced anise-flavored liqueur called Herbsaint. Where to try it: Sazerac Bar, the former Sazerac Coffee House that has changed several owners and locations, but now can be found in the Roosevelt Hotel. Given that I only had 3 days in New Orleans, I think I did pretty well on the culinary front. 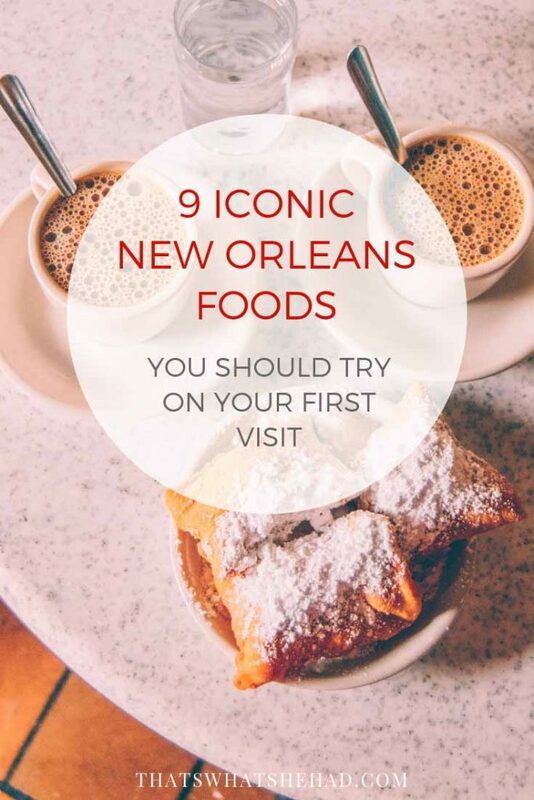 But here are a few other iconic NOLA dishes I haven’t had a chance to try, but you definitely should! Alligator meat which is sold at the markets as jerky and served in restaurants as alligator sausage. Crawfish etouffee, a thick sauce served with shellfish over rice. Blackened fish, invention of chef Paul Prudhomme that you can find in his K-Paul restaurant. Turtle soup, a stew-like soup made with turtle meat. The best place in the city to try it is said to be Commander’s Palace. Shrimp creole. As it’s obvious from the name, a Creole dish made of shrimps, tomatoes, and the Holy Trinity of Creole cuisine (onion, celery and bell pepper) and served over white rice. Bananas foster, the famous New Orleans dessert created in Brennan’s restaurant, where you can still find it. King cake, a pastry with purple, green and golden icing and a plastic baby-doll hidden inside that is a seasonal specialty and can only be found during Mardi Gras. What else to read? This guide to New Orleans written by a local and this guide to using Kayak heat maps that will help you find accomodation next to the best restaurants in the city. Creole Food vs. Cajun Food: What’s the Difference? Beignets of course! so good! When its super hot I really like their iced/frozen coffee too! Oh I didn’t get to try the iced coffee! All the more reasons to come back!